Computed tomography (CT) is a useful imaging modality for visualizing organs, bones and tissue as cross-sectional images using X-ray. The X-rays however, introduce the body to radiation which over time in high doses can lead to cancer. Low-dose CT is a more desirable alternative however it has reduced signal-to-noise ratio (SNR) and streaking artifacts that make diagnosis and visualization difficult. Noise in low-dose CT can be caused by a number of reasons such as quantum noise and sensor and hardware equipment phenomena. Moreover the noise in reconstructed CT images result in unknown noise distributions with spatially changing noise statistics. Existing approaches correct for the noise prior to, during or following reconstruction. 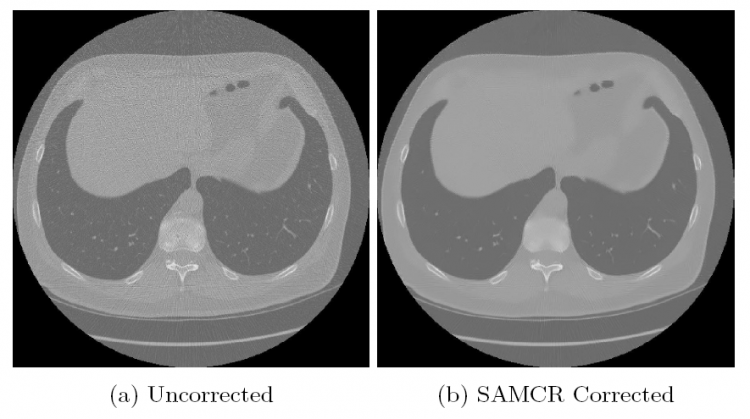 This work proposes a reconstruction approach called Spatially Adaptive Monte Carlo Reconstruction (SAMCR) that corrects for the non-stationary noise in low-dose CT using a spatially-adaptive approach. The noise-compensated reconstruction is estimated using non-parametric modeling based on a spatially-adaptive Monte Carlo sampling approach. The resulting reconstructions effectively compensate for varying levels of noise, streaking artifacts and detail without introducing new artifacts or removing fine structures. 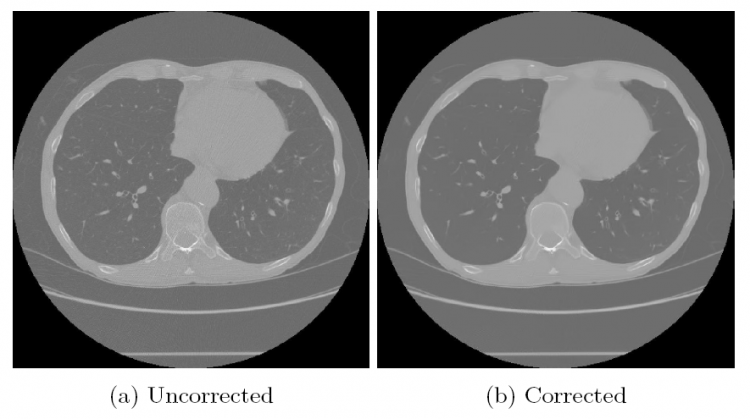 The approach was investigated using phantoms and low-dose CT lung images. See Fig. for examples. Fig. 1. An example low-dose CT slice with higher noise contamination. SAMCR effectively suppresses the noise and streaking artifacts while maintaining the fine details and structures within the lungs. Fig. 2. An example low-dose CT slice with lower noise contamination. SAMCR preserves the details while accommodating for streaking noise without the introduction of artifacts.